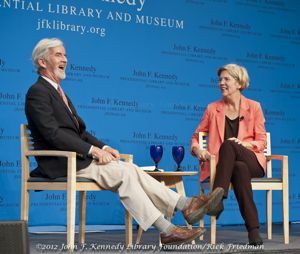 Elizabeth Warren‘s race for the Senate in Massachusetts looks like what Harold Macmillan had in mind with the famous quip — when asked what actually changes the direction of things: “Events, dear boy, events!” If the lady law professor from Oklahoma and Harvard in her first run for office can re-take the lost “Kennedy” seat, it could mark a moment and place when the second Gilded Age was called to account by a one-issue candidate. If, on the other hand, the upset winner in 2010 of Ted Kennedy’s unfinished term, Republican Scott Brown, can win as a photographer’s model of suburban contentment, on likeability and slogans like “He’s for us,” the event will mark something else — unflappable composure, perhaps, or psychic numbing. Elizabeth Warren has been the cutting edge of the Democratic Party on the “money issues” since Barack Obama took office, often resisting and goading him. She’s still hot as a pistol on YouTube — berating Timothy Geithner back in 2009 for pampering Goldman Sachs in the AIG bailout, explaining to Michael Moore why you can’t buy exploding toasters in the USA but exploding mortgages are okay. Her campaign is a lot cooler than that and can sound blandly repetitive on the theme of rebuilding the middle class. But the drift of her books, teaching and regulatory career is clear: public investment empowered American life, while abusive private power, specially since the 1970s, has bankrupted the American dream. She could hardly have imagined the drum-beat of summer scandals — the Barclay’s bust, LIBOR rate gaming, JPMorgan-Chase’s disappearing billions, the torrent of unattributed campaign money — that might be taken to reinforce her point. We’re in conversation at the JFK Library overlooking Boston Harbor. Senator Brown declined the Library’s invitation to this session, but everybody’s left doors open to another. The notion was somewhere between campaign stop and an open seminar — maybe a park-bench conversation before 600 people on the state we’re in — and how the researcher of works like The Two-Income Trap: Why Middle-Class Parents are Going Broke sees it differently now on the main streets of Massachusetts. On the day we met she was celebrating the second birthday of the Consumer Finance Protection Bureau which she designed for the Obama administration — and where many friends, including Ralph Nader, expected the President to put here in charge. Instead the White House encouraged her to try out her ideas (and some of theirs) on the hustings.